Victaulic technology proved to be a dependable solution for fire protection at one of New Zealand’s largest cold storage facilities lo-cated at Auckland International Airport. Currently under lease to a global cold storage company, the Auckland warehouse is part of a global network and works on 24-hour time for demand and delivery. Auckland Airport contracted Protech Design Limited to review the glycol fire protection system al-ready installed in the building. The original glycol system presented serious safety concerns for the warehouse. Since there was no secondary trigger device, there was serious risk of accidental operation which could also result in possible freezing in the piping or damage to the piping or sprin-klers. Any of these scenarios could prove disastrous for the leaser, and potentially damage client relationships, a case study noted. These risks, along with the high cost and inefficiency of glycol, pushed Protech Design to consider other options. 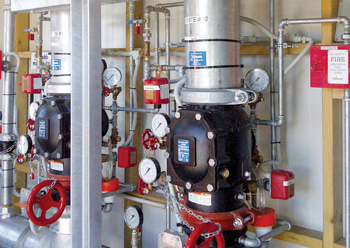 They selected a FireLock NXT Preaction System from Victaulic for such a harsh environment. Since this site had no secondary holding facility for back-up during system installation, it was critical for the freezer to remain functional at its -21°C operational temperature throughout the entire construction phase to minimise damage to the existing ware-house stock. The situation demanded a prefabricated fire protection system that could be quickly and easily installed, ensuring that contractors and machinery were inside the cold facility for as brief time as possible. Auckland International airport employed Argus Fire Protection to remove the existing glycol system and install a roof-only, dou-ble interlocked, dry pipe, pre-action system. In order for the pre-action system to actuate, two or more fire detections would be re-quired to let water into the pipe. If a single release event occurs, alarms sound but the valve will not operate and water will not flow until a second release event is detected, therefore significantly reducing the chance of accidental water discharge and freezing in the pipes. “The easiest, fastest and most economical installation method proved itself to be the Victaulic grooved system consisting of Fire-Lock NXT Series 769 Double Interlocked Pre-action valves installed with Victaulic FireLock EZ Rigid Couplings. To ensure dependa-ble pneumatic detection, Victaulic LP-46 Upright sprinklers specifically designed for storage spaces were chosen to be installed,” the study recalled. Accommodating business as usual in the facility meant that Argus Fire Protection labour forces were working in an operating freezer of -21°C, creating serious health and safety concerns. To minimise risk as much as possible, strict guidelines were put in place to limit the time of exposure. Further complicating the process, battery life of installation tools and electric powered platforms were drained exponentially faster due to the cold temperatures. This resulted in a slow and disjointed installation process. Argus Fire Protection contractors sought innovative products that could reduce installation time in the freezer. “Only Victaulic could offer the competitive advantage and an overall answer to this complicated task – in the form of a state-of-the-art pre-action system, joined with installation-ready couplings. 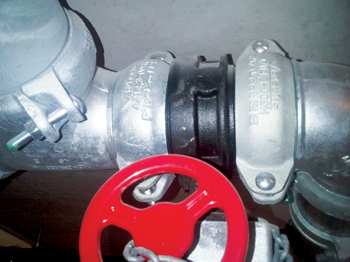 Victaulic Firelock EZ Style 009N rigid couplings were chosen as they significantly reduced the time spent in the cold and allowed the pipefitters to install them without removing their gloves,” the case study report stated. Victaulic LP-46 upright sprinkler heads were a stand out feature in the redesign, installation and certification of the Auckland facili-ty. The LP-46 is specifically designed for fire control in single, double and multiple row solid piled storage in a freezer up to the maximum roof height of 13.7 m.
The low flow and low pressure requirements of this FM full-scale fire tested and approved solution also allowed Protech Design to re-use the existing fire pump and fire water supply tank at the facility, saving Auckland International Airport significant capital ex-penditure. The Victaulic LP-46 sprinkler head utilises a standard response fusible element. As the ambient temperature rises to the rated tem-perature of the sprinkler head during a fire, the soldered fusible link melts, thus activating the sprinkler and clearing the waterway. In a large cold storage facility such as this, where the threat of fire rapidly spreading has historically been high, the LP-46 has a de-flector which is specifically designed to disseminate the water in a pattern that will most effectively control growing storage fires. Installing this type of system saw the elimination of in-rack pipes and sprinklers, ensuring more flexibility for storage and racking and maximum operational performance for the facility. A roof-only system also reduces the chances of a forklift damaging in-rack sprinklers in turn causing false activations. This type of system also makes storage rack location flexibility possible for any future changes in layout. “Victaulic Firelock NXT Preaction System was the valve set of choice due to its speed of response, simplicity of opera-tion and reduced footprint. The valve sets were delivered to the site in the VQR (Vic Quick Riser) configuration – fully pre-trimmed allowing direct connection to the riser and requiring only minimal on-site work,” the study showed.